Last week’s Art Journal Adventure prompt was to use text as the initial layer in an art journal spread. I am not the greatest at layering so it was useful to have the nudge at having another attempt at it. It happened to be valentine’s week last week so I took “love” as my theme. My valentine’s week was actually themed around stress – two valentine’s parties to organise and run at work, three class parties to attend that afternoon for three of my kids, and cooking a dinner the kids complained about, and we don’t even celebrate Valentine’s Day – but I decided my art journal page should focus on “love” regardless. Layer one was my handwriting in ink covering the page, running in multiple directions, overlapping, until it became completely illegible, and all I wrote were whatever love song lyrics happened to drift into my head. Once that layer was complete, I decided to scrape some acrylic paint over it. Annoyingly, this all but concealed the handwritten layer. Ugh. I just cannot get this layering thing right. 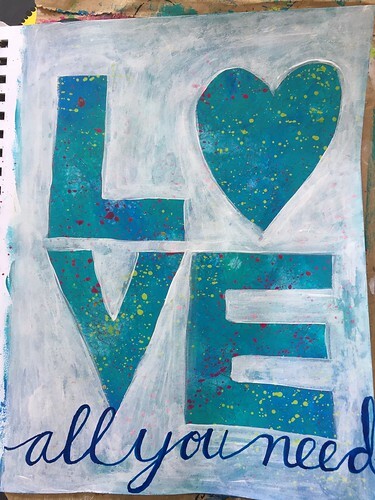 Ploughing on, I decided to reintroduce text again so I used negative space painting with white gesso to carve out the word “love”. It was all still a bit meh and blah so I picked up a paint pen and scrawled “all you need” across the bottom of the page. I am going to be happy that I was intuitive about adding an element but I rather suspect it was a wrong move. The whole page, therefore, is very ho hum. But that’s OK because, in a crazy busy week, each layer was a moment of calm in a day. This week’s Life Book lesson was way out of my comfort zone. 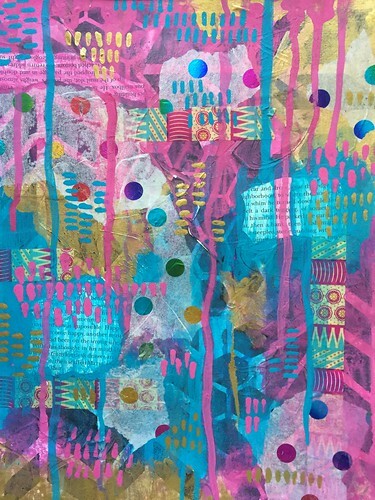 The tutor was Wendy Brightbill and she demonstrated her process of creating an abstract work of art through layering of different media and finding the tipping point between working intuitively and pulling it all together with intention. 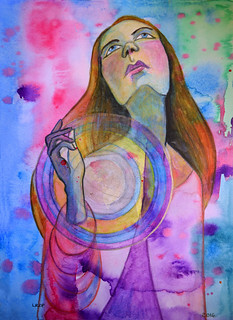 Intuitive and abstract are both things I really struggle with. I am, after all, a control freak and more of an illustrator than anything else. But that is the point in following an art course that has such diverse teachers – it forces me to try new things and experiment a bit. My piece did not evolve well. I loved the first layer and then it just got uglier and messier and more incoherent rather than cohesive. The thing that finally killed it once and for all was that I was way too “blocky” when applying some acrylic paint. I tried some dribble to make it more organic again and then, rather inevitably for me, some spatter. All was in vain. Those chunks of colour were neither geometrically precise enough to be part of the intent of the piece nor random enough to work with the previous layers. My choices were to either scrap the whole thing and forget about it (since I had no time in which to start over) or to just keep trucking and at least produce a finished outcome. I decided on the latter so I grabbed my paint pens and started doodling. It was still an ugly mess of a piece but I did at least really enjoy the doodles. I was adding the doodles while making dinner which meant I didn’t have the time to overthink what I was doing which was actually quite liberating (if one ignores the stress of multi-tasking). That doodle layer was, therefore, enjoyable. I do like the colour palette and think that works and I may repurpose this painting as the cover of a completed art journal. This month’s Life Book theme of Growth has meant lots of flower paintings. I am not remotely competent at drawing flowers let alone painting them. While this means I should probably just challenge myself to practice them, I don’t have time for all of the things I want to draw and paint so I just steer clear of the subjects that don’t particularly engage or inspire me creatively. Recognising, however, that I have now skipped a few Life Book lessons, I decided to push myself to completing last week’s lesson. It was taken by Roben-Marie Smith and was all about creating an abstract flower painting through layering collage and paint. 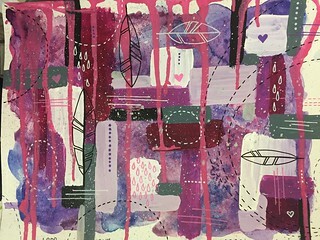 When I started experimenting with mixed media, layering was something I really struggled with. I made a lot of mud, a lot of mess, and found it difficult to make everything cohere into one complete piece. In recent months, however, I have found myself actually quite enjoying layering and especially if what I am aiming to achieve is a more grungy and abstract look. I, therefore, did not struggle with the layering aspect of this piece but again the flower element defeated me. I honestly think my 7 year old son could have done a better job of painting these flowers. Sure, I was aiming for an abstract, non-realistic flower look but these bright blooms just look daft. Well the lesson was worth doing if only to reinforce that I am getting better at layering and that flowers are still very much not within my wheelhouse. 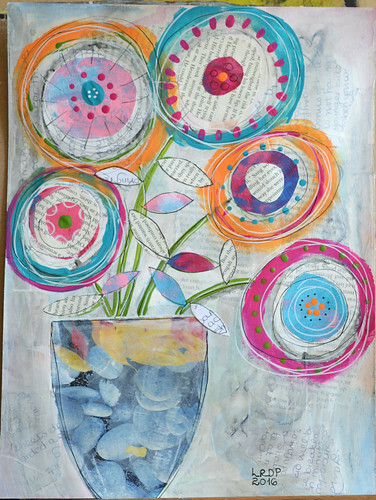 This week’s Life Book lesson was taken by Tamara Laporte and demonstrated a paint over collage technique. The subject of the painting was to be a figure with an animal and we were encouraged to choose an animal companion that reflected an aspect of ourselves (I think – I skipped that bit of the lesson). 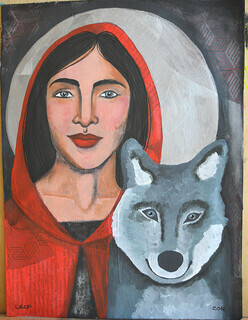 Laporte’s exemplar depicted a wolf and as soon as I saw that I had a notion to paint Red Riding Hood and the Wolf. For some reason, that is a subject I return to time and again with my art. I have even shared a couple of examples on my blog, one in my art journal and one in an altered book. 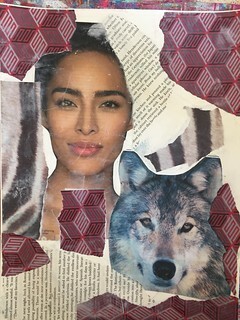 My collage layer was a bit of a mess and I was not altogether happy with the scale of the wolf but my oldest son needed to use the computer so I had to use the picture I had already printed out. It was not as if I was aiming for realism anyway. For some reason, whenever I paint over a collaged face, the chin and jaw always ends up too heavy. So odd. Indeed, I think the only trace of the original image is the eyes and the lips. The Wolf also ended up looking a bit smiley. I don’t think he was intimidating Little Red Riding Hood or anyone else on the path through the woods. Incidentally, the moon disc behind the figures is silver. It just does not photograph well and looks flat grey. I have definitely done better paintings over collage in the past but, ho hum, another lesson ticked off the list nevertheless. This week’s Life Book lesson was taken by Renata Loree. I loved that it was a lesson about layering with watercolour because watercolour and ink are my artistic comfort zones but layering with several layers is not. I, therefore, felt like this was a good opportunity for making some progress with that aspect of my art work. 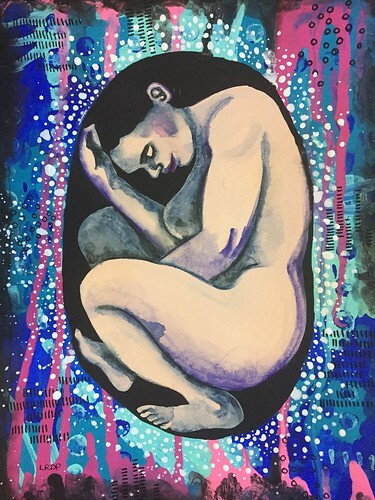 The concept behind the lesson, as I understood it, was to depict a figure with an integrated mandala representing energy and light radiating outwards. I did not even attempt a mandala because, as I have proved, they are not really within my wheelhouse. I, therefore, drew concentric rings so that visually I could aim for a similar concept of radiating or spiralling outwards. It is not clear in the photo but there is silver paint in the centre of the circle and its very perimeter. I really enjoyed the layering process and it was all going well right up until the point where I added neutral colours for the skin and hair tones. That was when it all went a bit muddy and murky. I should have stuck with it all being in cool colours. The additional challenge of the lesson was to draw a face tilting upwards. I ended up with a face that just looked squished and weird. Fail. Bizarrely, I thought the hand was going to give me the most trouble but it ended up being my favourite part of the piece. Lessons learned aplenty.